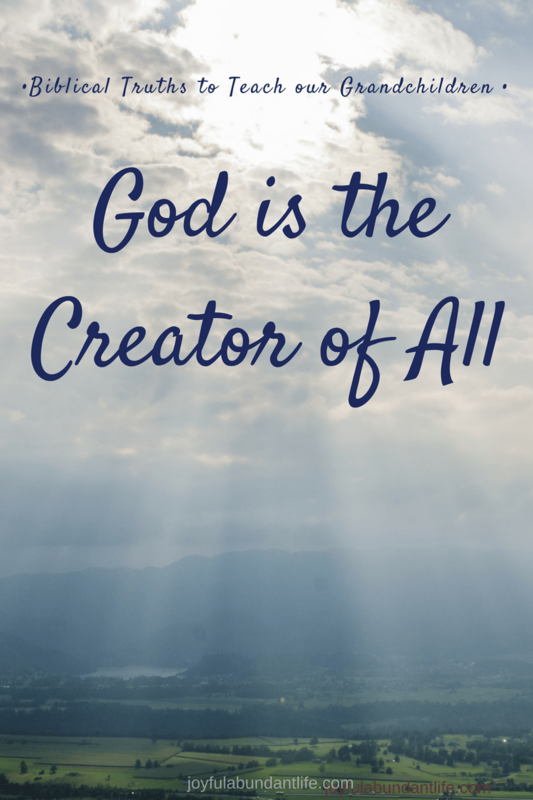 God is the creator; He is the creator of all! He created all things. God is, was, and always will be. This Biblical truth can be instilled into the hearts of our grandchildren from the time they are very small. Teach them the order of creation and then drill them. You can have fun with this. Stress the fact that God made them in His own image and each life is important to Him. I especially like to ask the little ones regularly, who made you? Point to the world around you and the beauty we get to enjoy and ask them: Who made the trees? Who made the flowers, the birds, the sun, moon and stars, the world and all that is therein? GOD DID! Reinforce this in their hearts and minds day after day. It is not brainwashing! It is truth. God is truth. He is absolute truth and the truth is what I want my grandkids to know and believe. Use every bit of God’s creation to teach them. Some of my grandchildren really appreciate beauty, flowers, mountains, oceans, stars – they see God in creation, but we need to tell them who God is and that it is He who made everything! Teach them since God began everything, He ought to be the beginning of every day of our lives and everything that we do. It’s not just cute to hear them say “God did”, but it is a thrill and a blessing to know this truth is being instilled into their little minds. Feel free to use this pdf file that I made on the days of creation. One time I took a picture of all the littles in my class and added that picture to my lesson. They loved it! They liked looking at themselves and it was a good way to reinforce that fact that God made each of them and has a special plan for each life and that He is the creator of all! I’m so glad that God made me. And God made the shape that I am in. I used free graphics from this site and made my own visualized song. (feel free to use it) There is a second verse which speaks of God’s love and Salvation, but I have not yet made it into a visualized song. The music (affiliate link) comes from one of the Child Evangelism Song Books. The littles in my class love this song! They sing it out loud and strong and it is a wonderful way to get it into their little hearts and minds that GOD MADE THEM! 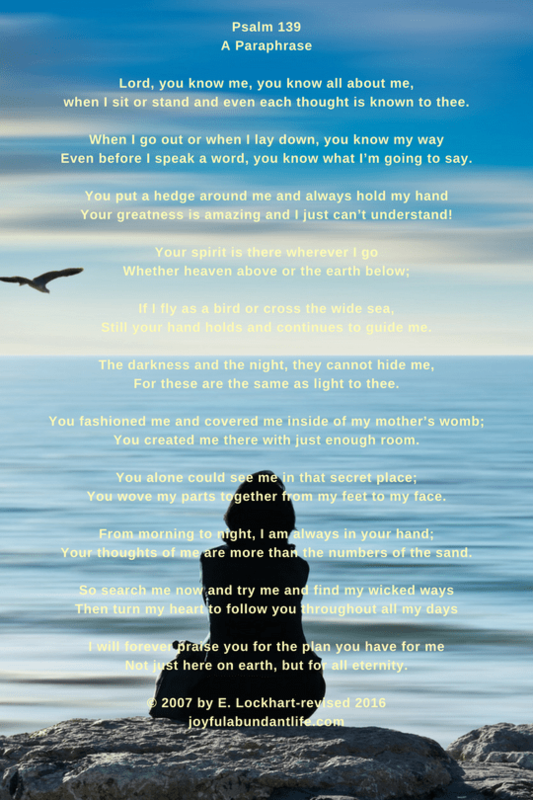 I also wrote a poem based on Psalm 139 which so wonderfully describes that God fashioned us in our mother’s womb. He knows everything about us, even the number of hairs on our head. Aren’t those wonderful truths to tell your grandchildren? And they are not fairy tales! I posted a series on Biblical Truths to teach your grandchildren. You can begin the series Here.